As Japan's dwindling ranks of farmers grow old, scientists are developing new ways to lighten their physical load and keep them productive. At the Tokyo University of Agriculture and Technology, a research team led by professor Shigeki Toyama has developed a wearable power-assist robot suit designed to boost the strength of farmers working in the field. Relying on real-time data from an array of sensors that detect muscle movement, the suit enhances physical strength by controlling the movement of 8 different motors that provide support to the shoulders, knees, arms and legs. To the wearer, heavy objects seem as light as 10 kilograms (22 lbs). In addition to providing extra muscle to lift and carry things, the power-assist robot suit helps farmers with manual tree-pruning work by enabling them to hold their arms up for long periods of time without getting tired, according to the researchers. The suit also doubles the wearer's strength when performing grunt work like uprooting oversized daikon radishes from the earth. 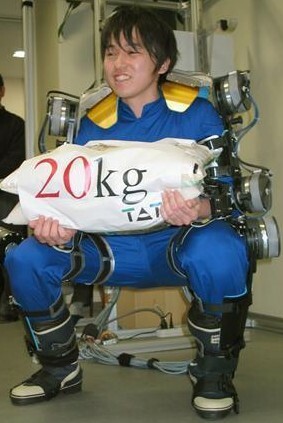 At the unveiling on January 9, 25-year-old graduate student Ryosuku Tanaka demonstrated the suit by lifting and carrying 20-kilogram (44-lb) bags of rice. "I hardly feel the weight," said Tanaka. "It's as if I had powerful muscles." The developers hope to make the suit commercially available in 4 years, at a price of 500,000 to 1 million yen ($4,500 to $9,000) each. These types of suits are also being developed for soldiers. Should bring in the younger folk to work in farms (Hmmm, salaryman or Mecha-Farmer?). Having spent a weekend on a farm in Kamogawa i can certainly see the advantage of such a suit ... my back and legs were killing me! imprinttalk.com » Blog Archive » Power boosting exo-suit! Power Suits | Boldly Go!